This was a fun project..re-covering an old board book and sorting it and myself out. This definition of a Journey expresses all an Art Journal can be... an expedition, a pilgrimage, a daily visit to and visual recording of place..
journey |ˈjərnē|noun ( pl. -neys)an act of traveling from one place to another : she went on a long journey | figurative your journey through life.verb ( -neys, -neyed) [ intrans. ]travel somewhere : they journeyed south.DERIVATIVESjourneyer nounORIGIN Middle English : from Old French jornee ‘day, a day's travel, a day's work’ (the earliest senses in English), based on Latin diurnum ‘daily portion,’ fromdiurnus (see diurnal ).THE RIGHT WORDWhile all of these nouns refer to a course of travel to a particular place, usually for a specific purpose, there is a big difference between a jaunt to the nearest beach and an expedition to the rain forest.While a trip may be either long or short, for business or pleasure, and taken at either a rushed or a leisurely pace (: a ski trip; a trip to Europe), a journey suggests that a considerable amount of time and distance will be covered and that the travel will take place over land (: a journey into the Australian outback).A long trip by water or through air or space is a voyage (: a voyage to the Galapagos Islands; a voyage to Mars), while a short, casual trip for pleasure or recreation is a jaunt (: a jaunt to the local shopping mall).Excursion also applies to a brief pleasure trip, usually no more than a day in length, that returns to the place where it began (: an afternoon excursion to the zoo).Unlike the rest of these nouns, expedition and pilgrimage apply to journeys that are undertaken for a specific purpose. An expedition is usually made by an organized group or company (: a scientific expedition; an expedition to locate new sources of oil), while a pilgrimage is a journey to a place that has religious or emotional significance (: the Muslims' annual pilgrimage to Mecca; a pilgrimage to the place where her father died). 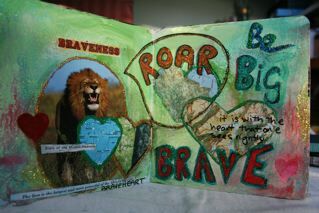 These pages inspired by an online Art Journalling course called 21 Secrets. They are backgrounds to work on...stops the fear of a looking at a blank page. I used very simple low tech methods..gesso and paint, crayon and dye..although once I started, I had dreams of screen printing and I wanted to move quicker through these basic processes to more elaborate things...And I will at some stage, but for now, I want o use as many cheap and simple processes as possible and low chemical ones to achieve satisfying pages.